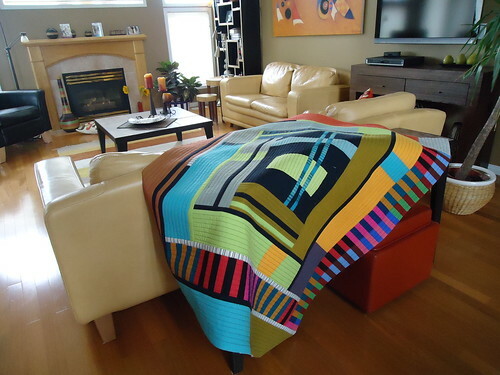 That QAYG quilt is stunning. Are your seams thick where you join it up? 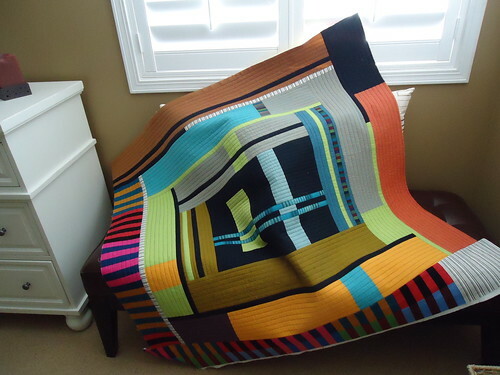 The colours and whole look of the quilt is gorgeous. Why do I want to jump up and make a copy of every quilt that you design? I am so addicted to your style. This latest quilt makes me smile :>) every time I check in to see what you've done next. Just when I think it couldn't be any more perfect, there you go again, making perfection more perfect. I think you have me convinced to work with some solid colors. I love this piece!! The colors look so good together ~ ♡ it! I'll be leaving soon for 2 weeks, and I'm taking my computer with me so I can see what you are working on. OMG! I had the scale of this piece totally wrong. I love the impact this has, especially now I can see how large it is. It's gorgeous Marianne. Thanks so much for sharing. I think I can safely say that this quilt is the most beautiful quilt I've seen. I've liked other quilts, can admire the fancy stitching on some, love the pattern on others etc, but this quilt really gets to my heart. I hope you will show us how you add your borders 'cause you have to know we all want to make our own version! This is a GORGEOUS Quilt! Well done! Very nice Marianne!! I also thought this quilt was smaller. The colors are so vibrant and of course your living area is nice too!! gah. i am swooning over this. This is wonderful! The design is great and I look forward to your tutorial. But it is your colour and fabric choices that make this so wonderful, your colour talent is exceptional! Just love what you are doing with this quilt. I've never been able to quite get me head around the QASG technique but your tutorial maade it so easy to understand that I'll be giving it a go. Thanks for the inspiration - I'll be checking back on progress regularly! Warm greetings from New Zealand. Thanks Philippa...I'd love to see what you come up with. All I can say is WOW! I find your qults very inspiring, your colors are lovely! Your skill with colour always blow me away - off to see what Chawne's up to. simply amazing ... you've got a fabulous eye and I love the concept of a 'growing quilt'! love the organic way it grows and the colours are so vibrant they sing!